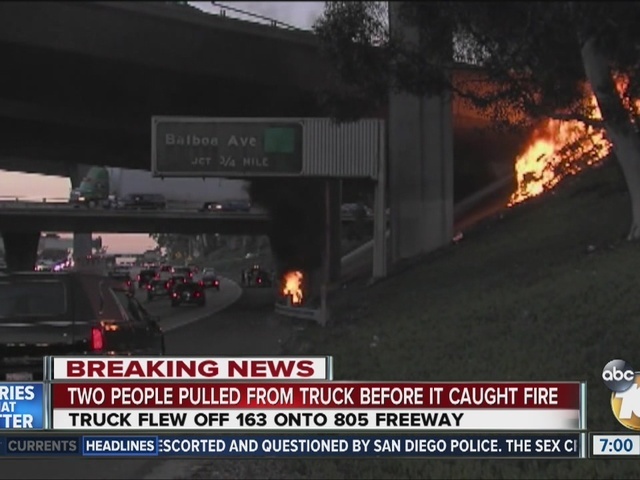 SAN DIEGO -- An investigation was underway into the collision that caused a box truck to drop over the edge of a Kearny Mesa freeway overpass late Thursday afternoon, land near another freeway below and burst into flames. A 2013 Ford Focus rear-ended the 2015 Isuzu box truck on northbound state Route 163 over Interstate 805 around 5:15 p.m. Thursday, according to a California Highway Patrol statement. The truck's 22-year-old driver lost control and crashed through the guard rail. 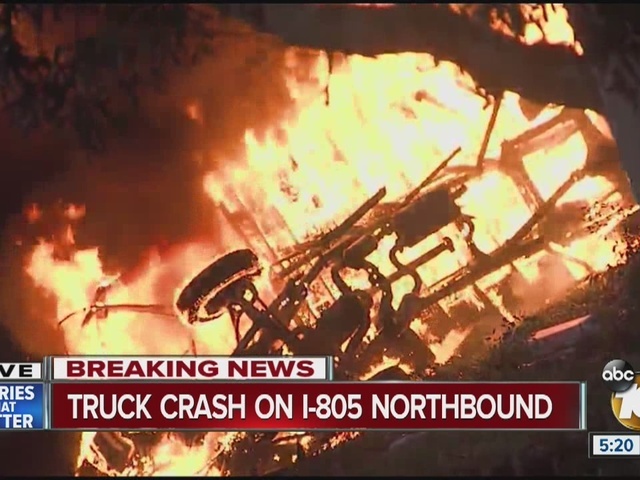 The truck came to rest in the vegetation alongside Interstate 805. Three workers from a solar company were driving on I-805 when they witnessed the truck slam onto the ground. The workers then jumped to help the driver and his 20-year-old female passenger trapped inside. "We ran up to the aid of the female first, brought her to safety," RJ Paglino told 10News. "(We) ran back, pulled the gentleman out and brought him roadside. Thirty seconds later, the vehicle exploded and engulfed in flames." "It was dangerous," Jason Pittman added. "We all jumped out of the truck and got them out and then it exploded. It was dangerous, but I figure anyone else would do the same thing." Medics took them to a hospital for evaluations along with a person involved in a secondary crash, San Diego Fire-Rescue Department Capt. Joe Amador said. The truck's driver, a Carlsbad man, and passenger, an Escondido woman, were taken to a hospital with minor to moderate injuries, authorities said. The 18-year-old San Diego woman behind the wheel of the Focus and her passenger, a 23-year-old San Diego man, were treated for minor injuries. The burning truck set some nearby brush ablaze before firefighters put out the flames. The crash also led to lane closures and caused heavy traffic in the area into the early evening, the CHP reported.